The first weekend of June the Championship Enduro Series visited Blackhawk Farms Raceway on of our favorite race tracks. 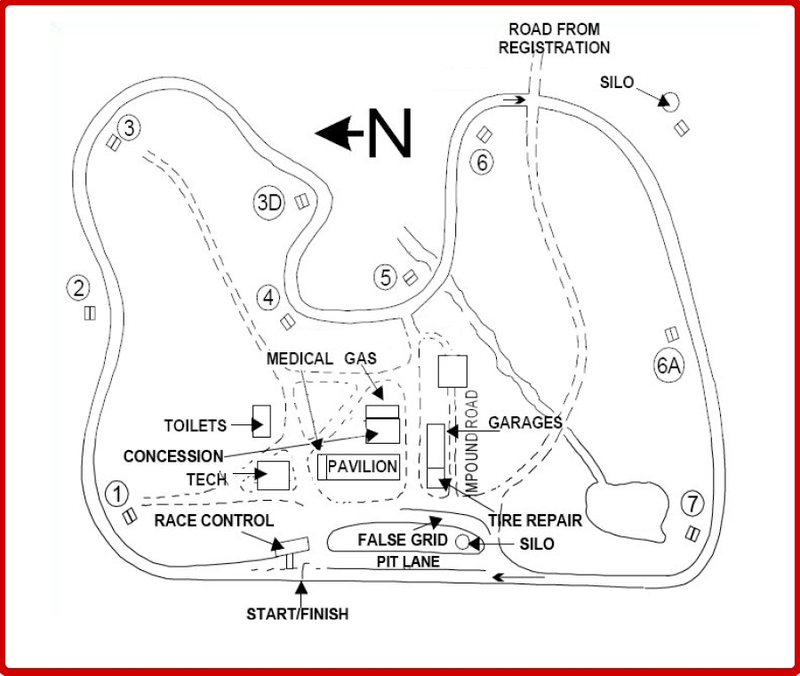 It is a 1.9 mile road course through the woodlands. The track is as challenging as the facility is beautiful, but mostly the track is fast and fun. 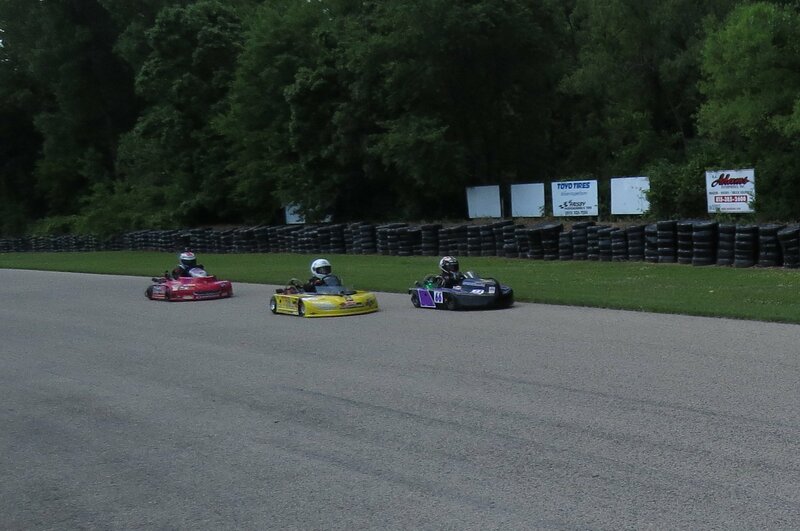 We had hoped that Jason’s main competition in the series was going to be at the track so he and Jason could finally race on equal terms, but he was off at Summit Point winning WKA races. However, we did manage to talk one of the top Junior drivers from the 206 Cup into giving road racing a try, so maybe he would have an Animal or find him one. Saturday practice was interrupted by rain but staff worked to get things back on track quickly. Despite the damp track kart was really fast. Jason’s first race of the day he started 2nd in his class(16th over all) and grabbed the class lead by turn 2 and then proceeded to pick up 7 more spots to finish 8th over all. Between races we had a chance to hang out with Dennis Michelsen from RaceTalkRadio. We had a good time swapping race stories and talking about racing promotion. The second race of the day put Jason first in his class. He pulled into the pits complaining of low fuel but it was just vacuum lock in the tank(fixed with some vent holes later), and he went out again to continue the race. Thankfully, he only dropped a single spot and that was not in his class. He still finished first in his class and 13th over all. After racing I talked to the LO206 driver’s dad about running Animal on Sunday and that he might be able to borrow one. It seemed that if we could find an animal Jason could have a race on his hands, so I got our old vega blue tires ready to put Jason on equal footing as the other driver also had is Blues on. As we learned at Gateway tires really matter. Overnight other team found an an animal, so I finished setting up Jason’s kart and went over to the other pit to help get our friends ready to race. Jason’s practice session showed some promise, but I adjusted rear gear tooth up for a little more power out of the corners, which seem to do the trick. By the time we where ready for race 1 he had dropped 3 seconds from Saturdays best time. Race 1 started badly as he dropped to 2nd but was in front by the time his group hit the carousel, from there he was chasing down the 360 karts again moving from 16th to 8th by the finish. Jason’s last race of the weekend again started badly as he dropped from first to third, but again he was in the lead by the carousel but the new guy was hot on Jason’s heels. 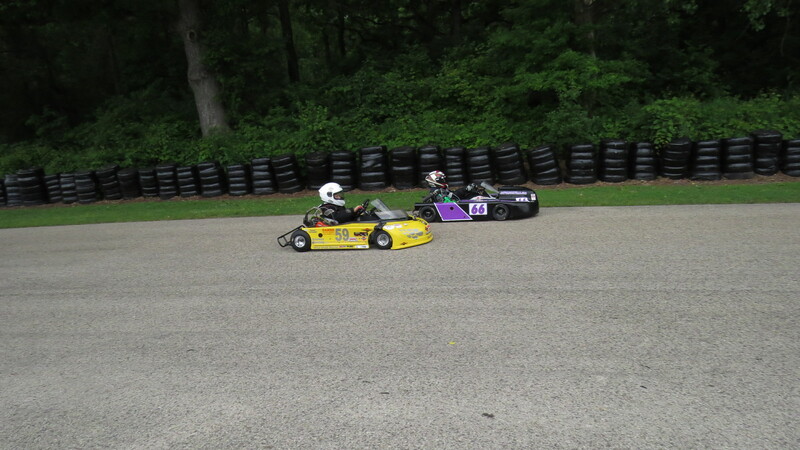 With in a couple of laps they both caught up the the tail of the 360 karts. Jason would pick off a 360 kart and make space but would be slowed by another as they leapfrogged up through the field. Our rival would catch up, but then Jason would get around the next guy. Eventually Jason passed a kart the the new driver could not get around. Within a few laps Jason was out of reach and making a clean sweep of the weekend in his class. Sunday Race 1 As is our habit after CES races we took the kart and some trophies to the Monday Night Car Show at Old Orchard Mall. 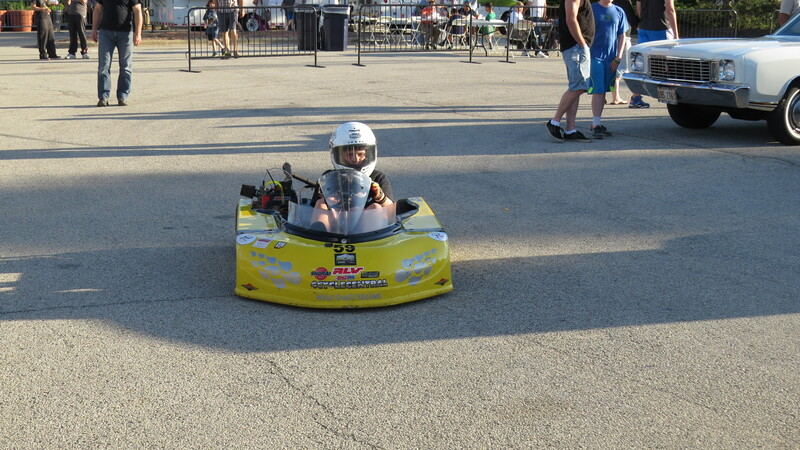 This time Jason did a few parade laps around the show, letting folks see and hear the power of that little kart. Folks think the kart is cute until we tell them how fast it goes. Jason’s next race will be at Badge Kart Club’s Briggs and Stratton Raceway Park with the 206 cup. Badger is one of Jason stronger tracks so hopefully he rack up enough points to get to first place in the series. Thanks to all our friends with the Championship Enduro Series. Thanks for keeping us posted on Katie’s event while we are off breathing gas fumes.